The cats have some kind of death wish. 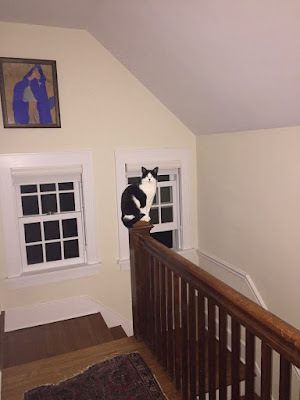 They perch atop the newel post, and then they walk along the banister rail. If you look closely, you'll see scratching on the part of the banister in the foreground. Yes, one fell off once. But that's not why I took this picture. The cat, Rainbow, seems to be mimicking the painting of a house on the wall behind her. I made that, back in, oh 1967? It's tempura on now yellowy-brown newsprint, framed by my mother behind glass in a nice oak frame. For about 40 years, it hung in the back bathroom of my mother's house, on walls patch-worked with framed treasures from the elementary school careers of all of her children. This particular one? Somehow it went home with my sister when we sold the house. She, in turn, wrapped it up and gave it to me for Christmas. And now, my cat is imitating it. OK I love this photo so much.